Tasmania is a relatively small island, some 250km north to south, about the same land mass as Ireland. There is just one single viticultural geographical indication, but the cool, moderate, maritime, climate location of the whole state means that small local variations in weather, soils and topography result in differing outcomes for wine styles. Rainfall varies considerably. The west coast takes the brunt of the roaring forties trade winds, and annual rainfall on the west can reach 2,400mm. This falls to around 600mm on the east coast, resulting in viticulture than requires irrigation. The north south divide is not quite as marked. The south is drier than the north. Hobart has around 600mm, while northern areas around Tamar valley and Pipers river have 800 to 1,000 mm. This piece focuses on conditions in the north, with other areas to follow. It is the north that has larger vineyards than the south. 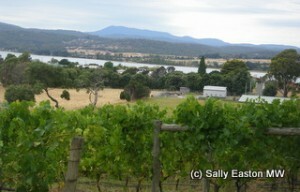 The two main areas in north Tasmania are the Tamar valley and Pipers river, and they are gaining repute for notably different styles: Tamar mostly still wines; Pipers mostly sparkling. 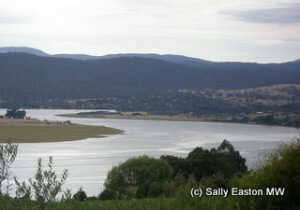 The Tamar valley is immediately north-west of Launceston, and Pipers river is due north. The Tamar river is a broad river, up to three kilometres across in some places, contributing a moderating influence in the cool climate. Proximity to the river helps maximise temperature, and most vineyards are found on the left bank. There are no other similarities to Bordeaux. There are a few vineyards on the east side of the Tamar, but sunshine is a bit meaner here, and the land is generally a flatter. The west side has a bit more slope to work with, though botrytis is “part of the landscape” especially at Kayena, said Andrew Pirie, consultant to Tasmanian Estates. 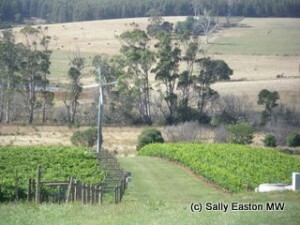 Tamar Ridge Kayena Vineyard Botrytis Riesling is a stand-out Tassie wine. Disease pressure is also an ongoing challenge in this valley, and over at Holm Oak, also on the Kayena peninsula, Tim Duffy said “drainage is important, and we leaf-pluck on both sides” to give better ventilation from the mostly westerly winds. Frost is a much greater risk in Pipers river. It’s further from the sea and the altitude, up to about 270m at Clover Hill, makes it a much higher-risk region, especially for spring frosts. Wind machines are evident in the vineyards, not least because rogue frosts can occur as late as October or early November. The river itself is a much narrower affair than the Tamar, though of a not dissimilar length. The higher altitude means slope becomes important – north-facing (toward the equator) slopes reduce frost risk. After years of leading the Tasmanian wine industry through various stages of development, four years ago Andrew Pirie planted his own two-hectare vineyard at 200m, just below and in sight of Clover Hill, on a north-facing slope. If he doesn’t know where it’s best to plant in Tasmania, then no-one does. Production at Pirie’s vineyard is going to sparkling wine, and it is for sparkling wine that Piper river is producing top quality results. Producers include Pipers Brook/Kreglinger, Clover Hill, Jansz, Bay of Fires/Arras, and Delamere. Wines grown locally tend to high acidity, with focused intensity and purity of flavours. The bigger producers also draw fruit from other parts of Tasmania, giving them different fruit and a prolonged harvest season. Karl Schultz, the assistant winemaker at Bay of Fires said “for sparkling we have a three-to-four week harvest across the state. A third area in the north is developing around Relbia and Whitehills, to the south of Launceston, probably not close enough to either the North or South Esk rivers, between which rivers the area lies, to be labelled as such. The key players here are Tasmanian Estates with an 83ha vineyard at Whitehills, and Josef Chromy, with 61 ha at Relbia on north-facing slopes.